Dr. Daniel Mankens, Chairman of Neurology Beaumont Hospital, Michigan; USA. (The name is most likely misspelt, as Google correction suggests “Dr Daniel Menkes”). Dr. James M Gebel, Chairman of Neurology, Akron Medical Centre, Ohio; USA. These experts are currently practicing in Michigan and Ohio, USA (in close proximity to where Tahera, Taher, and Taiyeba live). It is clear that neither of them were treating Syedna Mohammed Burhanuddin RA as he was in London and they were 4,000 miles away in the U.S. Their comments are most likely based on reports given to them by the Qutbuddins. In brief, they have claimed that after suffering a debilitating stroke, medically, Syedna Burhanuddin RA could not have spoken coherently and performed nass, nor could he have drunk the sherbet that was presented to him in the hospital. I am not a doctor, but common sense tells me that although the field of medicine has advanced in the last several years it is far from diagnosing every medical situation universally. It is common practice that doctors are able to diagnose certain patients based on tests and results provided by other doctors, but in complicated matters, the creme of doctors would hesitate to pass any judgements unless they have physically examined the patient. How then is it possible for a doctor to pass comments on a patient he hasn’t seen or examined, let alone witness his spirituality (if indeed the Qutbuddins accept Syedna Mohammed Burhanuddin as a spiritual personality). How can anyone in the right mind blindly accept these statements or any reputable newspaper report them without any actual verification? I do not doubt the expertise of these doctors sought out by the Qutbuddin family. I only wish to highlight that the doctors might not have been aware of the importance of the incident they were commenting on or the age-old traditions and customs surrounding it. These doctors have only commented based on the material presented to them by those who have approached them from the Qutbuddin family and their supporters. As a Dawoodi Bohra and practicing member of the faith, I wonder on how informed the doctors were of the history of Dawat and the importance of nass. Their experience with Syedna Mohammed Burhanuddin RA was next to none and I am not aware of their understanding of basic Dawoodi Bohra customs (like the consumption of sherbet). No matter how advanced their comprehension may be in medicine, understandably, they would surely be less knowledgeable when it comes to these religious matters. Firstly, these respected doctors would not be aware of the importance of nass. According to Dawoodi Bohra theology, belief, and practice it is the greatest and most important task charged upon every Nabi, Imam and Dai. Only once nass is performed may each saheb ‘rest in peace.’ It is a tenet of our faith. The Duat Mutlaqeen swore to the Imam that no Dai would leave this world without passing on the amanat of nass to his mansoos for the salvation and najaat of mumineen. Come what may, each Imam has appointed their mansoos. Rasulullah SAW declared Moulana Ali AS his mansoos even though it meant that it would endanger his life. Syedna Taher Saifuddin RA has stated that the 49th Dai declared his nass on Syedna Abdullah Badruddin RA, at a time of illness when no other (ordinary) man could speak coherently. The nass has, was, and will be always declared ‘as if life depended on it’. For indeed, life does depend on it, all our lives. Secondly, I am unsure that these respected doctors have not been shown the video nor images of Syedna Mohammed Burhanuddin RA in Raudat Tahera on the 19th of Rajab 1432H, only a mere two weeks after this stroke. I wonder why no one chose to comment on this. The Fatemi Dawat website has alleged that Syedna Mohammed Burhanuddin RA, due to his stroke, was not medically fit to pronounce nass on Syedna Mufaddal Saifuddin TUS that day. I wonder why the Qutbuddins didn’t ask the doctors to comment on the events which took place this day? The actions of Syedna Mohammed Burhanuddin RA that day are not that of an ordinary person who had suffered a stroke. After a flight from London to Mumbai, we witnessed Syedna al Muqaddas RA enter Raudat Tahera on a palkhi and give salaami to mumineen exactly like he always would. Syedna raising his hands high in salaami and acknowledging the gathering. Then we witnessed Syedna Mohammed Burhanuddin RA, despite his stroke, sit on the ground as in namaaz, perform ziyarat, and walk around the qabr of Syedna Taher Saifuddin RA. 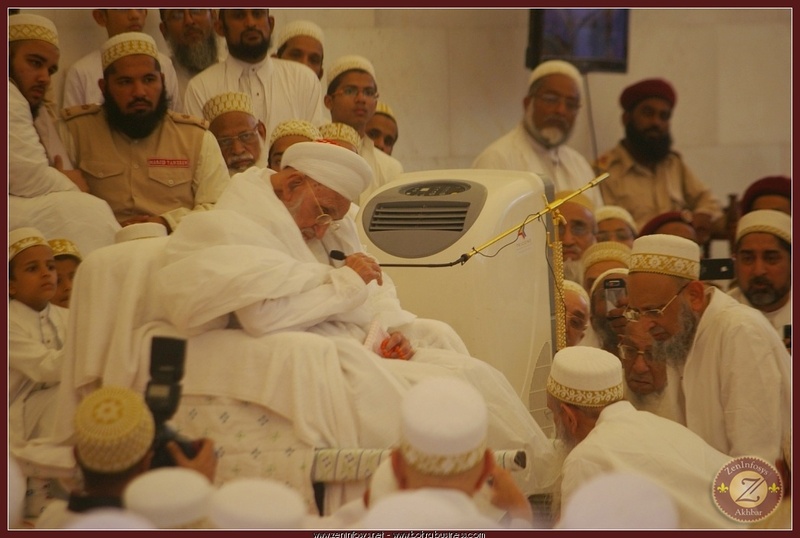 Syedna RA seated on the ground besides the qabr mubarak. Syedna RA performing ziyarat as he always did. We then witnessed Moulana Mohammed Burhanuddin RA acknowledging Syedna Mufaddal Saifuddin TUS in front of him, giving him raza to proceed, calling him closer, holding the mic and speaking and finally accepting the najwa from Syedi Mukasir Saheb DM. Syedna RA clearly giving raza to Syedna Mufaddal TUS without any aid and instructing him to proceed. Syedna RA bending over to speak to Syedna Mufaddal TUS with his hands on his back. Sh Abdulhusain Yamani, one of the Nass witnesses looks on overjoyed & with keen interest. 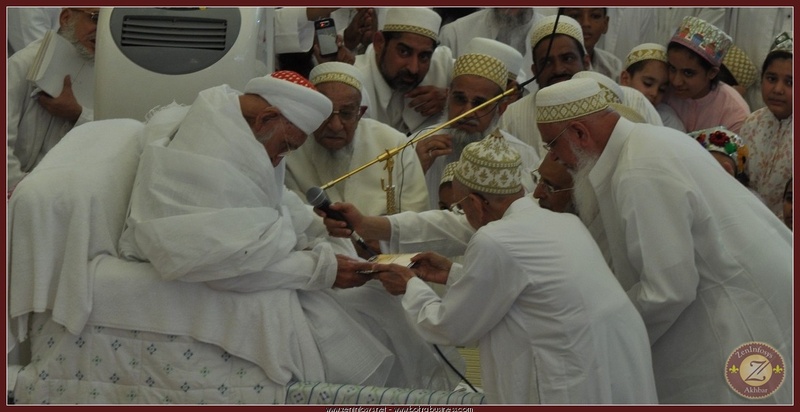 Syedna RA holding the mic with his hands and performing Nass. Syedna RA accepting the najwa tray. In the video at exactly (26:53 to 26:57) Syedna Mohammed Burhanuddin says “Mufaddal Bhai ne Nass nu Taaj“. We can also clearly hear Moula RA stating “Khuda Barakat Aape” (32.40 – 32.43). (this is from the video posted on the Fatemi Dawat website originally). All of this, which have witnessed, I believe refutes their following statement that “Syedna was too ill to speak coherently“. Furthermore, if these doctors were present during the first waaz on the 2nd of Moharram 1433H Hijri in Mumbai, they would have heard the short bayaan/waaz of Syedna Mohammed Burhanuddin RA, where many words of the shahaadat were crystal clear, especially the final closing sentence of و اخر دعوانا ان الحمد لله رب العالمين. I was present at both occasions, and I am proud to bear witness of what I heard. The rasm of drinking sherbet is to mark a moment of happiness; in this case it was the public announcement of Syedna’s successor, Syedna Mufaddal Saifuddin TUS. These moments of joy can be expressed by drinking sherbet or tasting sweets called saakar. The sherbet is usually drunk in tiny sips (sometimes almost the size of a drop), and saakar ranges from granules of sugar to chocolates or sweets. In this case, it is noted that Syedna was offered sherbet. The Qutbuddins obviously don’t know the specifics of the situation in the hospital because simply they weren’t there. Were the doctors aware that the consumption of sherbet in Dawoodi Bohra customs doesn’t mean that an entire glass of liquid is gulped down. That action possibly could have resulted in difficulty of swallowing. Even if the most tiniest drop was offered to Syedna Burhanuddin RA, it would be considered the drinking of sherbet for a joyous occasion. I am not aware of the quantity of of sherbet that was offered to Syedna al Muqaddas RA, but neither are they, so it is best not to pass judgements on blind assumptions. Any professional, let alone a respected doctor, would agree. The evidence is clear. For anyone who yet doubts, I would request them to read Reason #5 Analysis of Nass Video on Khuzaima Qutbuddin’s Website. and watch the video again. “Syedna [sic] Qutbuddin follows the path of his predecessors. The 51st and 52nd Dai have both established their rights in the Indian Judiciary when challenged; they have recognized the jurisdiction of the courts and defended their rights. In fact Syedna Mohammed Burhanuddin approached the courts as plaintiff to assert his rights as Dai.” (Sijil – A Weekly Newsletter of Fatemidawat.com, Issue 8, 5th Jamadil Ukhra 1435H). They go on to talk about the Chanda Bhai Gulla Case as an example and mindfully state that Syedna Taher Saifuddin RA ‘established’ his rights in the Indian Judiciary when challenged by an opposition. The wording chosen here in Sijil is important to note. In English, to establish something generally means to found, institute, build, or bring into being on a firm or stable basis. In other words, the author of the article in Sijil, the official newsletter of Fatemidawat.com – the official website of Khuzaima Qutbuddin – seems to be stating that the ruling of judicial courts are means to establish the rights of the Da’i Mutlaq. That is to say, if a court rules in favor of the Da’i it somehow affirms his position; it somehow legitimizes the position of the Da’i. Furthermore, they go on to claim that going to the judiciary system (which the community habitually respects and abides by to the fullest extent) is a customary action of the Du’at Mutlaqeen, namely the 51st and 52nd Dai Mutlaq when a need arose to ‘establish’ their position. Khuzaima and his children make this statement in order to justify their own current actions of approaching the Mumbai High Court as plaintiffs to ‘establish’ Khuzaima’s claim of holding the office of the 53rd Da’i Mutlaq and to seek legal adjudication ruling that Aqa Moula Syedna Mufaddal Saifuddin TUS is not our 53rd Da’i al-Mutlaq and successor of Aqa Moula Syedna Mohammed Burhanuddin RA. They want the Indian judiciary system to rule against and undermine the wishes and unfaltering belief of nearly 99.95% percent or more members of the Dawoodi Bohra community. They would like to make the Indian judiciary system a criterion for determining religious dogma and belief. Mufaddal Saifuddin should be restrained from holding himself out as or performing any acts or deeds as the Dai al-Mutlaq. and that no transfers should be made as regard to the trust’s assets. Thus, they are interested in limiting the power of the current 53rd Da’i al- Mutlaq Syedna Mufaddal Saifuddin TUS and controlling the funds of Dawat. It is quite baffling that anyone would be compelled to do this considering that almost all the members of the Dawoodi Bohra only accept Syedna Mufaddal Saifuddin TUS as their Da’i and will never consider Khuzaima Qutbuddin as anything more than a claimant to something that isn’t his. Yet this isn’t the first time Da’wat has been taken to court by plaintiffs seeking to remove the Da’i Mutlaq from power surrounding questions about nass. This last point is where Khuzaima Qutbuddin and his children have provided the readers of their website with a somewhat ahistorical account (because it is out of context) of the Chanda Gulla Bhai Case as a justification for their unprecedented action of dealing with the matters of Dawat-i-Hadiyah in court. They are somehow suggesting that the British-Colonial justice system in India was better suited to legitimize the position of the Da’i Mutlaq than the Dawoodi Bohra community itself and that Syedna Taher Saifuddin RA appeared in court himself to give testimony to ‘establish’ legitimization for the position of Da’i Mutlaq. When has ever an exterior party been more suited to pass judgement or make regulations for a religious community than the community itself? Before I go into the details of the Chanda Bhai Gulla case in the following point, I would like to first pose a question. What if any given legal system does not acknowledge the authority or power of the Da’i Mutlaq. Does this change the belief of the community? Would it actually sever the belief of the Dawoodi Bohra community for their Da’i – a belief which is based on love and devotion? The answer is obvious. The story of Syedna Qutbuddin Shaheed RA is etched in the consciousness of every Mu’min since it is a pivotal moment in our community’s history. Historically, Syedna Qutbuddin Shaheed RA was martyred in Ahmedabad because the Mughal legal system found him guilty of heresy during the era of the Mughal emperor Shah Jehan. During the early history of Dawat in Hindustan, the Duat Mutlaqeen had, for the most part, led the Dawoodi Bohra community with a fair amount of religious freedom in Gujarat under the early Mughal emperors. However, during the reign of his father, Awrangzeb began a campaign to limit those freedoms and to persecute religious minorities while he served as governor of Gujarat. This coincided with the era of Syedna Qutb Khan Qutbuddin al-Shaheed RA (1644-1646). In 1645, Awrangzeb arrived in Gujarat and under the influence of his advisor, ‘Abd al-Ghawī (al-Qawī) he persecuted all Shias including the Dawoodi Bohra community. He imprisoned Syedna Qutbuddin al-Shaheed RA accusing him of being a rāfḍī (a heretic). Dawoodi Bohra mosques were placed under Sunnī control and Syedna Qutbuddin Shaheed RA was eventually brought to trial. This court decided to put him to death due to a forged letter signed by the young children of Syedna Qutbuddin Shaheed RA in which there was a false testimony claiming that Moula RA acceded to being a rāfḍī (heretic). The court ruled against Moulana Qutbuddin Shaheed RA and ordered that he be punished by beheading. Moulana Qutbuddin Shaheed RA was martyred by beheading while giving sajda at the ground of Karanj in Kalupur Ahmedabad. This act was an attempt by Awrangzeb to bring an end to the community and sever our religious conviction and beliefs through fear and persecution. What Khuzaima fails to understand that it isn’t the tradition of Duat Mutlaqeen to seek the court’s ruling to determine the validity of the Da’i Mutlaq as he has claimed. On the contrary, using the judiciary system to challenge Dawat and the Dai is the action of those who have traditionally opposed Dawat. Khuzaima has sought to forward his agenda through the judiciary system in order to ultimately make financial gains and try to get an external party to award him the title of being called the Dai since Moulana Burhanuddin Aqa RA did not. However, Khuzaima will never be able to stake a claim over the hearts of the Dawoodi Bohra community. Almost 500 years ago, Awrangzeb, ‘Abd al-Ghawī, and Shah Beg tried to persecute the community in the guise of seeking a ruling through a judiciary system. However, history has shown that the subsequent will and belief of the community could not be faltered. Syedna Qutbuddin Shaheed RA told his persecutors near to his martyrdom that, “You might be able to murder my physical body but you will never be able to murder my soul.” Those words resonate today in the hearts of all Mumineen. Our message to Khuzaima and his children are – we do not fear you or your futile attempts to use the judiciary system to try and persecute our belief systems. We are united more than ever under our Moula Syedna Mufaddal Saifuddin TUS. We too have faith in the Indian judiciary system that they will uphold justice and the belief and well acknowledged resolve of the community in accepting Syedna Mohammed Burhanuddin’s RA successor Syedna Mufaddal Saifuddin TUS as the 53rd Da’i Mutlaq. This is EXACTLY the same video posted on Khuzaima Qutbuddins’s site. Although the audio is muffled, the words “Mufaddal bhai ne Nass nu taaj” are clearly heard at 26m:50s. Reason #5 Analysis of Nass Video on Khuzaima Qutbuddin’s Website. On March 12, 2014 the Mumbai Mirror published an article remarking on nine children who were kidnapped by the daughters of Khuzeima Qutbuddin, the claimant to holding the rightful position of the 53rd Dai al-Mutlaq of the Dawoodi Bohra community. In fact the article states, “On January 17th, the very day that the Syedna passed away, the children — who lived in Saifee Mahal, home of the Syedna and his family in Malabar Hill, were taken away to Thane by their mothers, and there has been no trace of them ever since.” The Mumbai Mirror fell short of reporting all the facts of the matter or their source conveniently left out a major detail. This detail is that soon after the abduction of the children, some of these nine children appeared in separate homemade videos in which they held scripts and read lines proclaiming that their maternal grandfather, Khuzaima Qutbuddin, was the true 53rd Da’i and how they have willingly adhered to his claim and cause. (Although these videos were also sent to me via whatsapp, out of sheer humanity and respect to both families involved, I absolutely cannot post them here. I do not only feel that such an act is exploitative, but I also would add that it seems insensitively cruel to do so.) However, I will say that the dispersal of these videos took place just three days after Aqa Moula Syedna Mohammed Burhanuddin’s RA demise. The videos were sent to members of the Dawoodi Bohra community in what seemed to have been an attempt by the Qutbuddin family to make them go viral and in many ways torment the grieve stricken families of these children who were mourning the demise of both their spiritual and actual father, Moulana Burhanuddin TUS. Regardless of the theological claims that Khuzaima Qutbuddin, his wife, and his children adhere to and purport as him being the 53rd Da’i Mutlaq, by publicly exploiting their grandchildren and those of Syedna Mufaddal Saifuddin TUS and Syedi Qaid Johar Bhaisaheb Izzuddin in order to cause them more turmoil in a time of mourning seems to be an act lacking any moral justification or human decency. Why did the Mumbai Mirror leave this well known detail of the viral videos out of their report? Furthermore, it should be noted that abducting children from their normal household situations and environments and abruptly removing them from the love and care of their fathers, grandparents, uncles, aunts, and cousins is one of the first acts Khuzaima Qutbuddin performed after he made his claim to being the 53rd Dai Mutlaq of the Dawoodi Bohra community. International kidnapping and child abduction is a very serious matter. It causes a great amount of pain and stress for all the parties involved, especially those families from who the children were taken away without their knowledge. In cases like these, children are made into innocent victims of their parents’ decisions to use extreme measures without the guidance and jurisdiction of civil courts. In fact, since October 25, 1980 the Hague Convention of Civil Aspects of International Child Abduction were put in place internationally to try and spare children from the harm which can ensue from such situations. Provisions have been instated internationally to ensure that children are returned to their families and proper custody hearings take place. India, however, is not a signatory of the Hague Convention nor does Indian law fully consider the act of parental kidnapping a crime. Perhaps, in the eyes of Indian law (and maybe not international or United States law), the Qutbuddin family has not immediately committed a crime. In fact, it is reported that often in such cases in India custody is awarded to the mother and solved by keeping the culturally sensitive situations in mind and by determining the factors which are best suited for Indian society. Therefore, the ultimate decision of the fate of these young innocent children who were abducted by their mothers on the day of Aqa Moula Syedna Mohammed Burhanuddin’s TUS demise is a matter which is left for the Indian courts. However, in any civil society, the law is hardly the only component to measure common morality and justice. Every human being has an inner sense of social justice imbued in the fiber of our being. Thus, even though perhaps no penalizing act has been done by the daughters of Qutbuddin according to Indian law (we will have to wait and see the efficiency of the Indian court system), a major injustice has been done. It seems very hard to believe that sanctioning the abduction of children, releasing exploitative hurtful videos of minors, internationally kidnapping children, and aiding and abetting criminals, could ever be the just and moral actions of any religious leader – much less anyone claiming to be the Da’i Mutlaq of the Dawoodi Bohra community. It seems rather ironic that Khuzaima Qutbuddin and his family are attempting to channel and utilize Indian law to try and prove their claims as being the rightful owners of the office of the 53rd Da’i Mutlaq while simply ignoring other aspects of the law and basic morality when it suits their own personal agenda. This is truly an unprecedented situation in the history of the Dawoodi Bohras. Husain Qutbuddin (HQ) claims that the text of Ehd al-Awliyaa’ (Meethaq) can never be changed and since it was changed following the nass by Syedna Mohammed Burhanuddin RA upon Syedna Mufaddal Saifuddin TUS, the latter cannot be a true Dai. Firstly, Syedna Mohammed Burhanuddin issued the directive to add the name of his mansoos to the meethaq text. The mithaal mubarak was sent by Syedna al-Muqaddas’s secretariat (Alvazaratus Saifiyah) and the first person to carry out this directive was Syedi Mukasir Saheb Husain Bhaisaheb Husamuddin. Again, at yet another milestone in the golden annals of Dawat the yadd and yameen of the Dai was nowhere to be seen. Secondly, there is no record of the mithaal mubarak being sent twice, as HQ claims, however, it seems highly probable that the Qutbuddin family were sent the same mithaal twice seeing as they were the least likely to comply. Thirdly, HQ claims that one cannot change the ibaarat (text) of Ehd al-Awliyaa’ at all, not even one letter. It is explicitly mentioned in the text that the custom of Ehd is not a recent one. From the very day that Allah created Adam Nabi, this custom was in place. Allah states in the Quran that ‘Indeed, we had beforehand taken the covenant from Adam’. Does HQ really believe that the text of Ehd al-Awliyaa’ is the same as it was during the time of Adam Nabi? In Lisaan al-Dawat? Repeatedly mentioning Imam and Imam’s Dai? Detailing the functioning of Dawat when an Imam goes into seclusion? Delineating the three posts by which the Dawat continues during satr? And many other stipulations that are particular to Islam and the period of satr? Does he really think that whilst the Dawat was based in Yemen, the Ehd al-Awliyaa’ was recited in Lisan al-Dawat? It seems he is also unaware of the fact that the clause ‘zairey dast’ (the Mazoon and Mukasir being subordinate and controlled by the Dai Mutlaq) was added by al-Dai al-Ajal Syedna Taher Saifuddin RA. His father may not even know, since it was done well before he came into existence. Will he now even accuse Syedna Taher Saifuddin RA of violating the nehj of Dawat as he has Syedna Mohammed Burhanuddin RA? The text of the Ehd al-Awliyaa’ can be changed, but only by the Imam and during his satr by the Dai Mutlaq, because it is to him that we are giving meethaq. It his meethaq, an oath given to him, surely then the one the oath being given to has the right to alter it as he sees fit. The Imam and his Dai are not bound by the text of the Ehd al-Awliyaa’ but rather it is a means for them to convey to their followers what is expected and required of them. And as times change so does the language and content of Ehd al-Awliyaa’. HQ then goes on to claim that ‘mansoos nu iqraar dawat na kitaabo ma nathi’. Has he read every single Dawat text? Secondly, this is a classic example of putting the cart before the horse. Has he not read the narration of Amirul Mumineen SA placing the Quran upon his head and calling upon it to speak? Amirul Mumineen SA then declared that ‘I am the book that speaks’. It is a fundamental flaw in his aqeedah if he gauges the actions of Duat Mutlaqeen by Dawat texts. They are the living books and their actions are the nehj of Dawat. If a Dai of any time deems it necessary to add his mansoos’s name in the Ehd al-Awliyaa’, he has an incontrovertible right to do so. And those who question his authority to do so need to re-examine their adherence to the tenets of Ehd al-Awliyaa’. Therefore, citing examples of what Syedna Taher Saifuddin RA did regarding the text of Ehd al-Awliyaa’ after his nass upon Syedna Mohammed Burhanuddin RA is misleading. Different times require different courses of action. The Dai Mutlaq of the time knows which course to take. The awareness of the four odd people sitting in front of HQ is also commendable. One person blurts out that no changes have been made to the Ehd al-Awliyaa’ for 900 years. How does he know? Has he examined each and every manuscript? If his audience are so scholarly maybe HQ can rest his throat and let them conduct the remaining Q&A sessions. In the recording of Syedna Mohammed Burhanuddin’s RA waaz mubarak shown to Mumineen during Ashara 1435 H, he stated that Syedna Abdulhusain Husamuddin RA dismissed those who denied nass being conferred upon Syedna Abdulqadir Najmuddin RA and labelled them as ‘children’. Amongst the wisdom inherent in this statement, is the fact that some within these munafeqeen were 2, or 4, or 5, or 7 years old when nass was proclaimed. They were actually too young to know anything about nass at the time. The four Qutbuddin sons should realise that Syedna Mohammed Burhanuddin’s RA nass upon Syedna Mufaddal Saifuddin TUS was conferred long before they were even born.